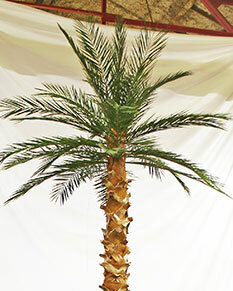 Tropical Date Palm, Standard, 4-15 ft.
30 fronds. 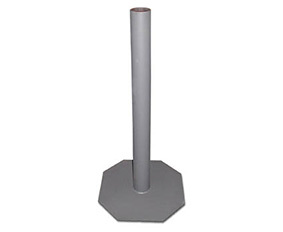 Foliage Span: 6-8 ft. Trunk Base diameter: 12-16"
Weight is 5 lbs. per foot. Natural trunk. Priced by the foot. Tropical Date Palm, Giant, 15-45 ft.
40 fronds. Foliage Span: 11-12 ft. Trunk Base diameter: 16-25"
Sets into your decorative planter, garden or tree pit. You simply cover the base plate in gravel to secure the palm. 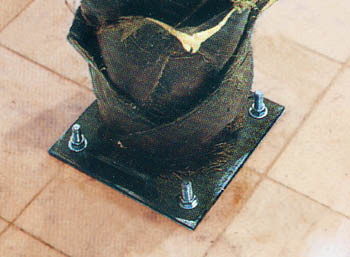 With this method you bolt the plate to the floor. No decorative container is needed. All Preserved Palms have inherently fire retarded foliage. This process is done when the fronds are preserved. The inherent fire retardant will not wash off. Custom curved trunks are available. 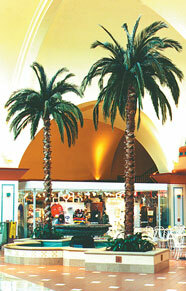 Palms over 20 feet tall may require additional steel support. Please contact us to discuss your project.